Members of the Cal Poly Democrats, the American Indian Student Association, the SLO Peace Coalition and more protest Raytheon's presence at the Cal Poly Winter Career Fair on Jan. 24, 2019. Students and members of local activists groups gathered outside Cal Poly’s Winter Career Fair Thursday in San Luis Obispo. They were protesting the campus presence of U.S. defense contractors—like Raytheon—who recruit at the fair. The demonstrators shouted, sang, and held signs that read “Peace Over Profit" and "Divest From War." But at previous career fairs, a much smaller group of students went inside to protest the same companies. They sat on the ground and sang songs. This handful of students was later investigated for disrupting university activities. The investigation was later dropped, and no one got in trouble. But it raised questions about what is and is not free speech at Cal Poly. In an effort to better clarify what disruptive speech is, university officials have launched a campaign to educate the campus community, passing out guides that explain free expression at school. 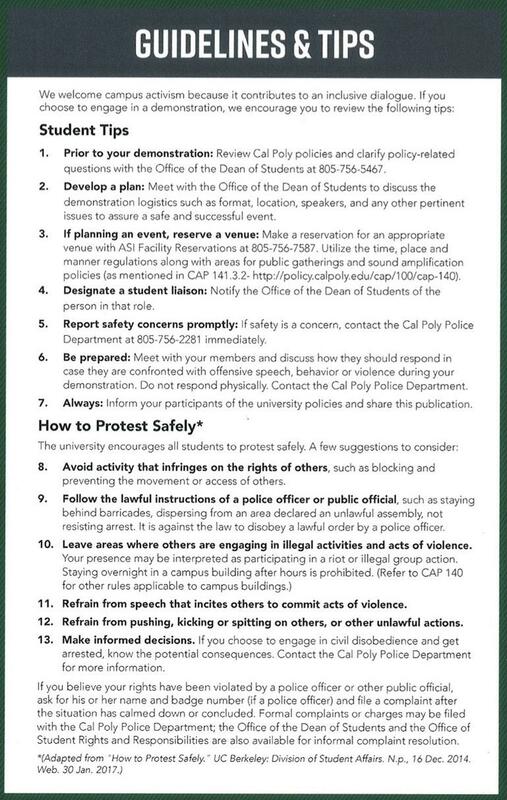 A page from Cal Poly's "Guide for Free Expression at Cal Poly." Time, place and manner policies are rules universities within the CSU system use to regulate free speech. Humphrey said time and place are generally understood. Examples being, don’t blast loud sounds in the early morning hours and don't blocking doors and roadways with demonstrations. It’s the manner portion that can get murky. But some in the campus community have argued the Cal Poly fraternity member who wore blackface last spring, and Milo Yiannopoulos’ presence on campus, twice, disrupted academic activities. “The time, place and manner policy is written so vaguely that the university can twist it however they deem fit,” Kelsey Zazanis said. 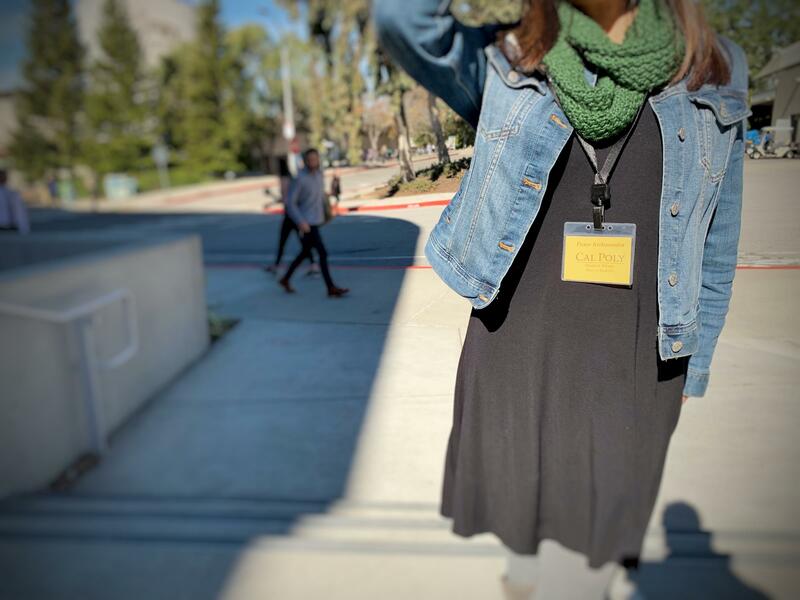 Zazanis is a Cal Poly student who has been organizing the career fair protests, and one of the students previously investigated by the university. “The nature of activism isn’t really to ask permission,” Zazanis said. Zazanis said she’s had to start thinking pragmatically about campus protests. Cal Poly staff members from the Dean of Students Office were assigned to be 'peace ambassadors' at Thursday's Winter Career Fair protest. Zananis said when the university got wind of this week’s planned protest, administrators initially wanted a police presence at the fair. But the two sides compromised, and agreed to have representatives from the Dean of Students Office at the rally. Their job was to inform students if they we blocking pathways or if rules were at risk of being broken. Ultimately, organizers said they felt like the rally was a success. Protestors passed out lots of materials and said they felt like they were heard. But they also have a list of demands for Cal Poly, like not making investments in producers of weapons or fossil fuel companies. And they say they will keep protesting until the demands are met. For Zazanis, the whole experience of protesting on campus has given her new drive. Cal Poly students who signed up to live in a private bedroom this coming school year won’t be living alone after all. The incoming class is the projected largest in Cal Poly’s history, and that means more students will need housing in an already tight market.